Babarpur is surrounded by Yamuna Vihar in east, Rohtas Nagar in west, Seelampur in north and Chajjupur in the south. The assembly constituency of Babarpur is a part of North East Delhi parliamentary constituency. The constituency has been a BJP bastion. Naresh Gaur of BJP won the 2013 assembly elections. He has become the MLA from the constituency for the fourth time. He defeated Zakir Khan of INC with a huge margin in 2013 assembly elections. 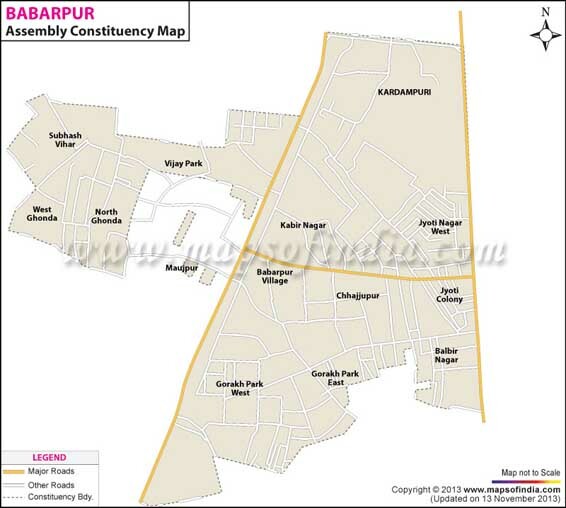 Map showing the different localities of the Babarpur Assembly Constituency. Below is the list of winners and runners-up in the Babarpur assembly elections conducted so far.